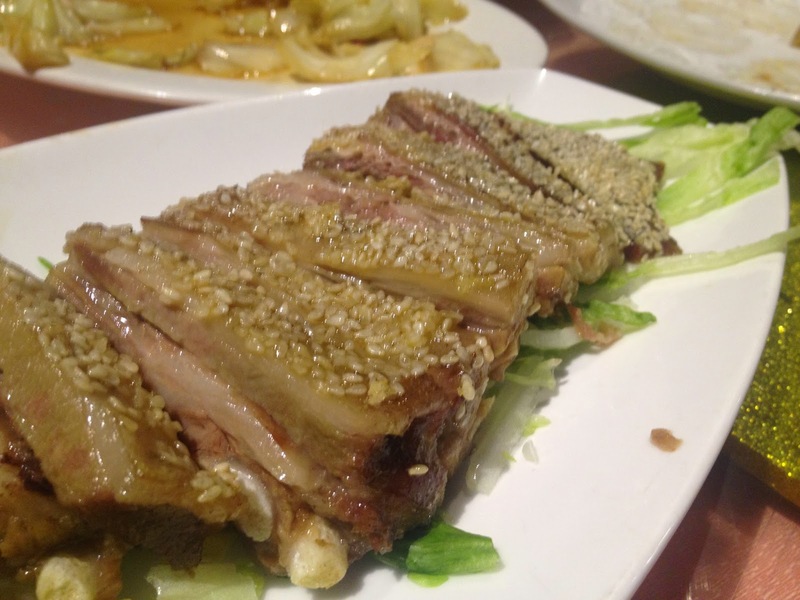 A group of 10 Yelp Elites had an Unofficial Yelp Event to celebrate the Chinese New Year. We were fortunate to have some people come that were familiar with the cuisine and the language to help us get the most out of the extensive menu. I was a little paranoid not knowing exactly what I was eating, but that didn't stop me! I had never eaten lamb, so this was exciting. Apparently, my mom was the only one in the family that liked it, so I didn't grow up with it. We started with Lamb Soup and tea. A large bowl was placed on the lazy susan and the event organizer, Jennifer, started dishing it out. 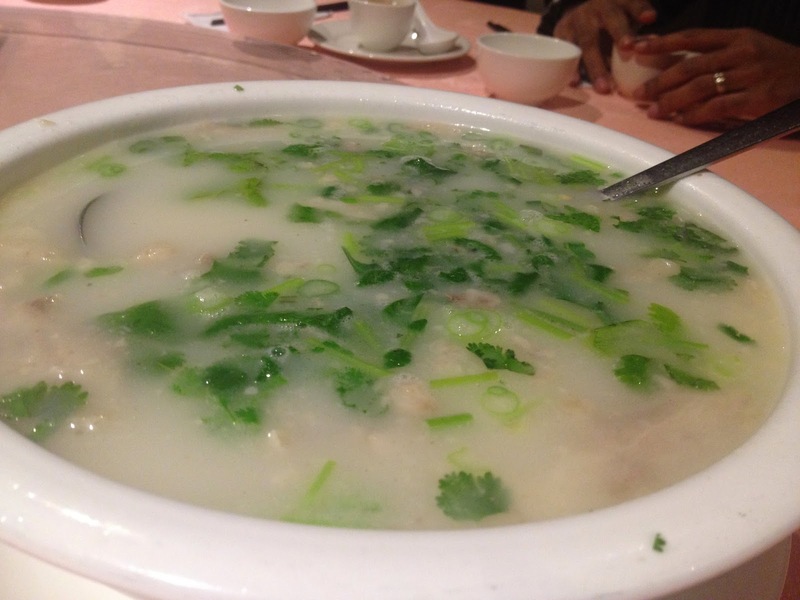 It was full of large lamb pieces and green veggies in a mild broth. A great starter. After the soup, the plates started rolling in. 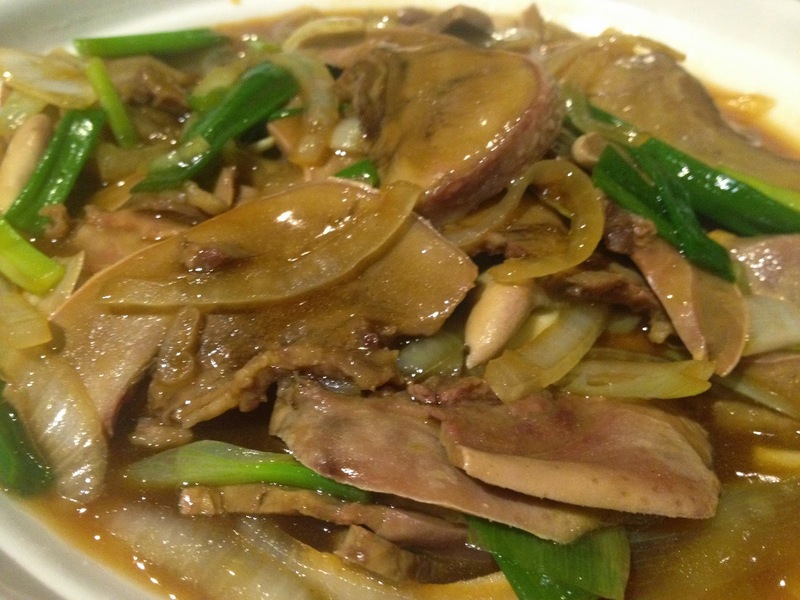 Fried Lamb Tongue, Fried Rice, Sliced Lotus Roots and various Lamb Skewers were placed on in the center. 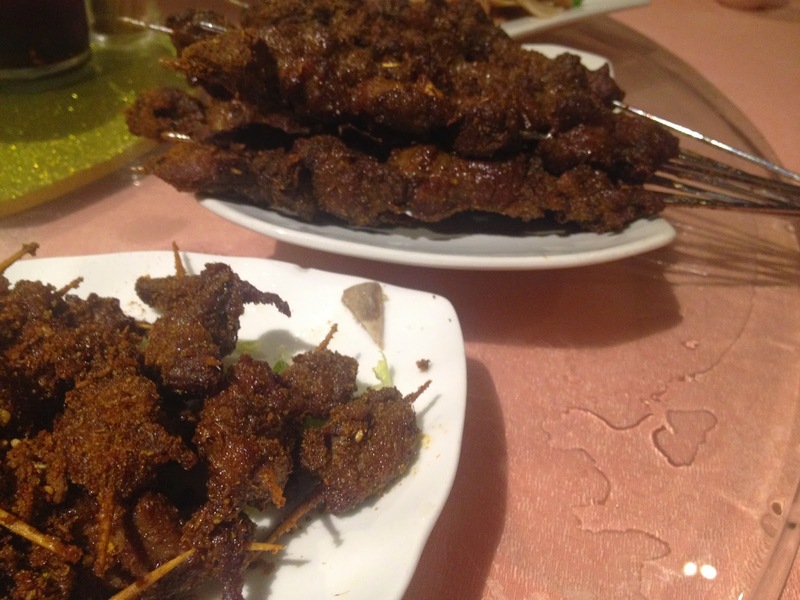 The lamb skewers were a little chewy, but packed with flavour. So packed with flavour, that I needed my tea refilled a few times. It was flavourful with a kick. On the flipside, the lotus didn't really taste like anything. The rice gave balance to the overload of taste from the skewers. I ate lamb tongue. I freaking ate lamb tongue. I didn't find out what it was until the next day when the pictures were posted on Yelp. It wasn't bad. It DID have a unique texture, but mixed with the veggies and sauce it was alright. Call it an exotic stir fry. Next entrees to arrive were Lamb Pancakes, Beef and Lamb Dumplings, Sesame Lamb Chops, BBQ Lamb Chops, Spicy Fried Cabbage and the BBQ Lamb Shank. I love dumplings and these were no exception. 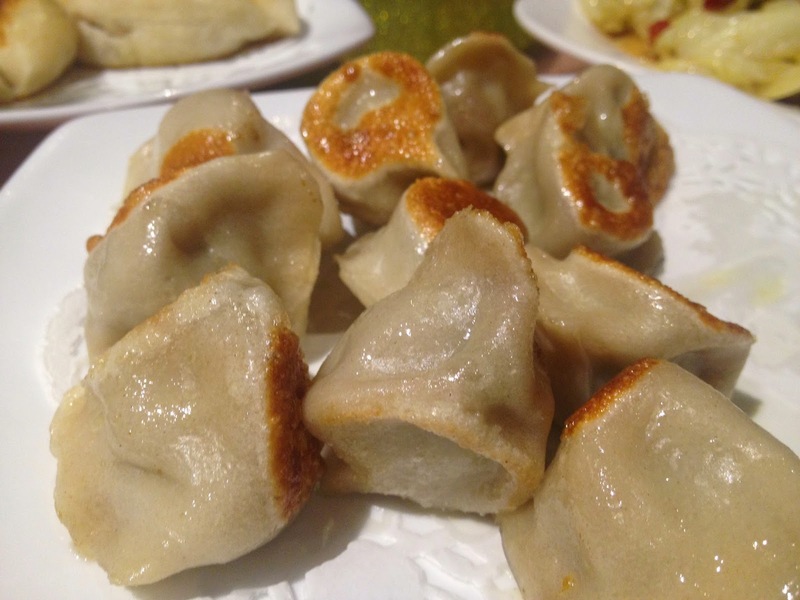 Lightly pan fried and full of meat, both the lamb and beef dumplings were seasoned just right. My favourite was, hands down, the lamb pancakes. I do realize that the pancakes were a safe choice for someone like myself, but I simply couldn't resist them. There also wasn't enough tea in those tiny cups to put out the fire in my mouth from the skewers. The lamb chops were fantastic; each with their own seasoning or sauce. I'm a sucker for anything sesame and they did not let me down. The BBQ chops were seasoned with cumin and it brought the heat. Most of the group liked these the best. Juicy and tender; both chops were winners.The lamb shank was HUGE. I'm glad it was already cut, because that would've been a lot of work. The BBQ flavour was similar to the seasoning on the chops; spicy and just plain good. The meat was tender; you didn't need a fork or knife to eat it. A great time! A great meal! I'd go back again. Good quality food and good service. Thanks to this experience, I'm definitely going to test the lamb waters again.